The latest Y series Netbook/Laptop was just launch by Sony. 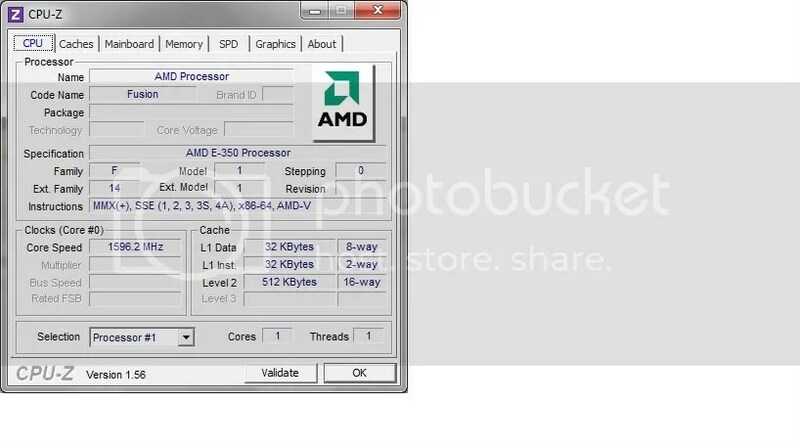 This is one of the first to be on sale in Singapore using the E-350 CPU with 6310 GPU. It is so new CPUID does not have much info about it. The model I got is a YPCYB16KG. From CPUID the GPU is running at 400Mhz instead of the 500M that the chipset is capable of. Maybe a tweak with an updated drivers will boost this speed. According to some review The computer is CPU limited more than GPU limited and most of the video and Games that can be played on this system is limited by the CPU. According to my Java SunSpider benchmark it complete in 2132.7 ms. Which I estimate to be 80% of an Athlon II performance per clock cycle.So it should run much like a 1.4G Althlon II. Pretty impressive It is much faster then a ATOM. Considering the size of this 11 inch screen with a full size keyboard it is a very worth replacement for my ATOM netbook. For video playback I have no issue with at resolution of 1280*768, very smooth lag free and the system is still very responsive. AMD claimed that this combination could play back BluRay HD at 1920 but so far no luck for me using the latest build of VLC. On paper this machine should sip on battery but on my brand new machine I estimate that it would last at about 4.5 hours on net surfing duties. The battery that comes with the unit is a 3800 mAh BPS25. It is a bit disappointing here but acceptable.A very pleasant machine to use as it is cool to the touch. Except that the air vent for the heat sink is located at the left hand side. You will feel the heat if your hand is resting on the table. This netbook/laptop is very easy to mod.. Just by removing 3 screw on the back of the computer you will be able to add RAM, harddisk and wireless module. Easily upgradable by an end user. What I would like to know is if this unit would accept 4G RAM module and upgrading it to 8G. Sony claimed that 4G is max but that might be because the unit comes with a 32bit version of Windows. Will be testing 4G module soon as the CPU is 64 capable. I manage to swap a harddisk and install a new set of windows but unfortunately I could not find drivers for the 6310 graphic card. Considering the performance and price and weight of the machine . I think it is a very good value currently. It is about 50% faster than ATOM. weight 1.46kg and cost SGD$899 during launch. It makes me wounder why would anyone want to pay for a ULV1.3 CPU costing 3~4X more. We could easily buy a big fast SSD and upgrade this machine. (That is if I can get my hands on the drivers). Not to forget the build in GPU 6310 is faster than any solution from Intel.